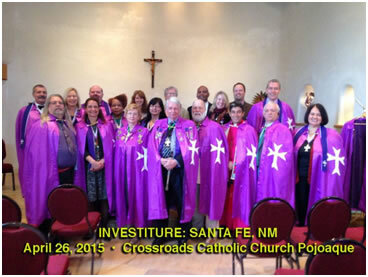 On the 26th of April 2015, another solemn investiture of the Sacred Medical Order of the Knights of Hope was held at the Crossroads Catholic Church in Santa Fe'. A number of postulants were admitted into this organisation, which is a fully fledged member of the United Grand Priories of the Hospitaller Order of Saint Lazarus. The Sacred Medical Order of the Knights of Hope also utilised this investiture service in order to further its Hospitaller, medical initiatives by means of establishing a US Priory formed of medical specialists and professionals who are all committed to give their valuable time and energy for Hospitaller initiatives, even outside the United States. SMOKH is indeed a prime instigator of medical and philanthropic initiatives in South America and the Caribbean and such a demonstration of willingness to partake in voluntary service within the Order is indeed the keystone of the success of the Order in this part of the globe.